I was perusing some research in the journal Medicine and Science in Sports and Exercise recently and came across a couple of disturbing statistics: Despite all the hoopla out there about taking 10,000 steps a day, Americans take an average of just 5,117 steps—nowhere near the numbers run up by folks living in places like Switzerland, Japan, and Australia. What's worse, U.S. women average even fewer steps—a mere 4,912 (versus 5,340 for men). C'mon, gals, we're better than that! I know what you're thinking: I'm too busy to walk more! But there's actually a simple way to get it done that doesn't require any extra time: Wear a pedometer. Numerous studies (including the one mentioned above) show that people who do tend to naturally walk more throughout their days. I think I know why. I started wearing a Fitbit activity monitor (think pedometer plus) almost a year ago. Suddenly, taking more steps became a game: How many could I do during the day? Could I beat yesterday's total? Slowly but surely, my number began rising. To boost it, I started pacing while waiting for the doctor, talking on the phone, and brushing my teeth. Stairs suddenly became an opportunity to get more steps in. I began slipping away from my desk every afternoon to take a short "brainstorming walk" to increase my number even more. Before long, moving instead of sitting became second nature. I knew the tide had turned the day I got to my office and realized that I'd left my purse in the car. Instead of feeling frustrated, I automatically thought: "Great, more steps!" You get the picture. Eleven months later, the bloom is still not off the rose, and I now routinely average 10,000 steps per day (including my workouts) without thinking too much about it. That's pretty amazing to me, given that when I started out I was averaging around 5,200 or so. You don't have to splurge on a fancy activity monitor like my beloved Fitbit, either—head to any sporting goods store or large retailer like Target and you'll be able to snag one for under $20. Still need convincing? 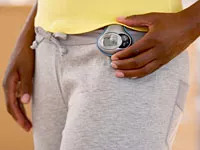 How about this: Pedometer wearers weigh less on average than those who don't. So to recap: Wear a pedometer and you'll start walking more, plus you're likely to begin slimming down in the process—no extra time required. What are you waiting for?